The Society of Digital Agencies is an extremely diverse community of digital agency leaders from across the globe. At the most recent General Member Meeting in Lisbon, I discovered new learnings regarding listening and empathy, and how both are critical to being a good leader. SoDA is a collective of about 100 member Digital Agencies from all over the globe, and each year we meet for the General Member Meeting. Due to the agencies being global, it’s the only time all of the agencies get to meet face-to-face. The GMM is an inspirational conference where leaders from similar companies to Red Badger openly share intimate knowledge about both themselves and their businesses. Member presentations can cover “how I survived stories”, unique perspectives on ideas and trends, experiments and learning in passion projects or personal growth and leadership. Each year I learn new things to take back and improve Red Badger. Red Badger has recently re-structured, moving to a devolved model with separate P&Ls each having its own Managing Director. This has resulted in a restructured leadership team who are all learning how to work together. It’s full of energy and excitement but naturally, there are things that can be improved in the team dynamics as you’d expect in any new team. At this year’s SoDA GMM, there were so many interesting sessions but there were two topics in particular that resonated with me in helping to improve the dynamics of the Red Badger Leadership team. The sessions covered the topics of listening and empathy. One of the keynote presentations from one of our guest speakers, Kevin Murray, was about “How Great Leaders Use Purpose And Charisma To Build Thriving Companies”. Kevin has written three books on leadership, and his presentation covered a number of topics from all of the books. I have since bought them, and have just finished reading “Communicate to Inspire”. I was particularly interested in chapter 9 - The Listening Leader - Why You Need to Listen Louder. You get angry when you hear things you don’t like and you show your displeasure, especially at bad news. In his book, Kevin argues that if some or all of these points ring true, then you are a non-listener or at best a marginal listener. He states that if this is the case, you are likely to be a poor leader and might even be disliked. 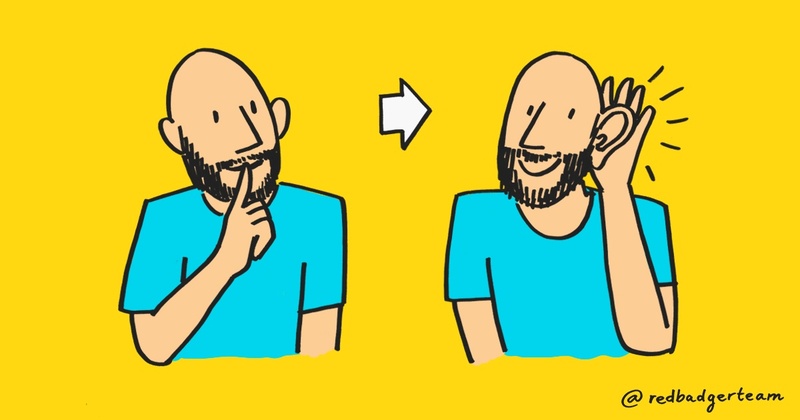 It's important if you want to be a good leader, to motivate and enthuse your employees that you become a good or inspiring listener by practising and demonstrating the seven listening techniques above. If you don’t, you risk being disliked or have disillusioned or demotivated employees. The second keynote presentation I want to discuss was a talk by Michael Ventura, the CEO of Sub Rosa, a strategy and design agency. Michael’s presentation was about Applied Empathy, a methodology that they have developed over a number of years. Applied Empathy is now a book, the origins of which began when Sub Rosa were asked to develop a 12-week course for Princeton University with the curriculum centred around Empathy. In Michael’s presentation, he discussed why Empathy was important, top-down versus bottom-up cultures, Human Centred versus Ecosystem thinking as well as Passive versus Pro-Active Leadership. The Confidant - Hears to listen instead of simultaneously planning what to say next (See Kevin Murray’s listening test above). The Seeker - An adventurous explorer that is confident and fearless. The Cultivator - Visionary. Committed to developing ideas and is intentional about every action. You are not just one archetype and none of the others. You will have a sliding scale of weak to strong against each of the archetypes, i.e. our persona will be made up of a sliding scale for each. After Michael’s presentation, he was also hosting a breakout session on Applied Empathy, which I attended as I was intrigued to find out more. In the session, he facilitated a workshop using the Questions and Empathy cards. These are an accompaniment to the Applied Empathy book that Sub Rosa use as a tool with all of their clients. We were first separated into working pairs. The questions and empathy cards are split into the 7 archetypes listed above and each has a question on the back of it. We were each asked to pick a card according to what we felt was our strongest archetype, (I picked The Confidant). In your pair, you then had to hand your card to your partner and they would ask you the question on the back of it. We had 3 minutes each to discuss ourselves directed by the question on the card. The question asked of me was “When is listening more valuable than counselling?”. A tough one to answer when put on the spot. We then repeated the process by picking a card that we felt was our weakest attribute. The questions were incredibly thought-provoking and hard to answer. The exercise is supposed to make you feel a bit uncomfortable, but interestingly after the exercise finished Michael asked everyone in the workshop the following question: “Who had just had a deeper conversation with a complete stranger to the conversations that you normally have with the majority of your own colleagues?”. Everyone put their hand up. In just over 10 minutes, it felt a real connection had been made between yourself and your partner. It was extremely powerful. The Applied Empathy book covers a whole lot more than just this exercise. I have bought the book and have ordered 4 packs of the cards because I am now really intrigued to see just how far I can go with it, and how beneficial Applied Empathy can be to myself, my colleagues and perhaps my clients. Since the GMM, I have been thinking about the behaviours of Red Badger, specifically the leadership team. In our weekly leadership meetings and our quarterly board meetings, listening and empathy are not the collective group’s greatest strengths. You can often find yourself frustrated when you don’t get to finish your sentences due to being interrupted. As a team, we all now have a coach and have all done our Predictive Index. This has gone a long way to each of us understanding our character profiles and how to work with each other. But there is a long way to go and we’re a new team who are still getting to know each other in the context of our new roles. Listening better and creating much deeper personal relationships using applied empathy will create a much better dynamic in the team and will make our discussions with each other infinitely more productive. The first steps I am going to take is to plan a leadership away day to focus on some of the softer skills that can help improve the dynamics of the leadership team. I will be using the questions and empathy cards to get the leadership team working more closely, and creating deeper relationships. I will also work on how I can take the learnings from Communicate to Inspire and create a small workshop to improve our listening capabilities to become better leaders. So, why is any of this important you may ask? As a consultancy, all of Red Badger’s employees need to exhibit great leadership skills, listen to our clients and be empathetic to their needs. It’s in part, what makes a great consultant. This has to start with the leadership team. If our team dynamics are improved as a result of better listening and empathic behaviour, the productivity of the leadership team will improve and we’ll get more strategic work done. But in addition to this, we’ll be able to share our learnings and approach with the rest of the company to help all of the employees become better leaders. We have a culture committee, and that is a great way to disseminate these learnings throughout the company, so we’ll be discussing that at a future leadership meet. Firstly, however, we need to work through some of this with the leadership team itself. The ultimate goal is to be facilitating questions and empathy sessions with our clients, but we’ll take this one step at a time. There’s a lot of work to do, but only good things can come of the week spent in Lisbon.